This was a bit of an unexpected photo that didn’t really turn out how I was hoping, but then, I’m not exactly what I was even aiming for in the first place so I can’t really complain. 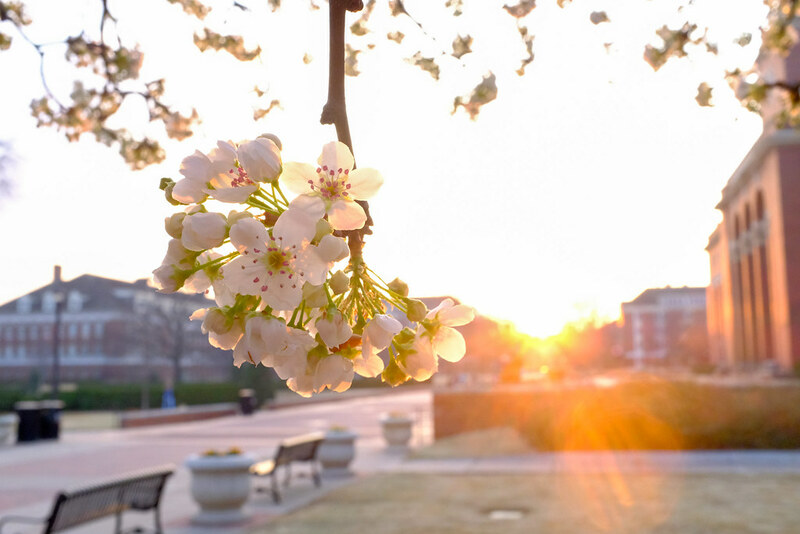 I took this when my wife and I were walking around campus with some friends in mid-March and I noticed these flowers on a tree which, combined with the setting sun and the relatively empty brick pathway, made for what I thought would be an interesting composition. I had my X100F with me since it’s my go-to camera for everyday casual shooting and while it worked OK on this image I think using a 50mm on my D750 would have been a little better for what I had in mind. Nevertheless, they say the best camera is the one you have with you, so I tried to make the most of what I had. Using my X100F I stopped down to f/11 to get a bit of lens flare and also keep the background blur from getting too out of control, and also switched from my usual Classic Chrome simulation to Velvia which is, as I understand it, better suited for nature and landscapes. I actually shot a couple similar images using Classic Chrome and didn’t really like the colors that much but Velvia gave me an image that was at least closer to what I was imagining. I also overexposed the image by more than two stops in order to keep the white flowers from being too dark. I always enjoy and learn from your posts, especially the use of close up lenses. It was very interesting to read your comments about JPEG. Not too often one reads a positive feed back on shooting JPEG. It is almost a taboo in the photography posts. It is refreshing to note your honesty, not only about JPEG but also start using a Fuji camera. Internet is full of articles about the virtues of Nikon and Canon. Not too much about mirror less system like Fuji. I switched last October from Nikon to Fuji XT20, due to its compact size, excellent OIS, Acros for B&W, Velvia for color and wonderful JPEG SOOC and lst but not least my limited knowledge of computers. I tried LR deligently, w/o success due to the difficulty in loading long RAW files and time consuming post processing of the images. Since I am strictly an amateur, I find JPEG from Fuji quite satisfactory for my purpose. Keep up w/ your posts which are inspiring as always. A big amen. I’m finding time spent getting the correct settings to get a good picture beats frustrating time messing with Lightroom. I’m strictly an amateur and a newby to boot. When I get to it and try getting some good macro shots, then I may go back to the raw. It’s interesting to hear what both of you are saying about shooting JPEG. For a while I thought “real photographers only shoot RAW” but lately I’ve come to realize that’s not true at all. Some people like RAW, some like JPEG, and some like both. It has nothing to do with how good of a photographer you are! I started paying attention to digital photography 2 years ago and have attended 3 photography workshops at different locations by different instructors. I learned a lot but also felt somewhat inadequate since ALL of them were focused on LR/Photoshop and high end wizardry to process the images. I fail to understand how one can apply presets in LR to 100’s of images shot in a particular photo shoot to speed up the post processing. May be a digital photographer should decide in advance if he/she wants to be an amateur or a pro. For a large majority (amateurs) JPEG will be sufficient and rewarding. Alternate is shooting RAW, spending time in downloading large files and post processing. IMHO all this debate about the RAW, post processing, expensive LR/Photoshop license and countless other photo editing programs, not to mention never ending new photographic equipment is pushing more users towards cell phone photography. You can see the result in declining sales of digital cameras.